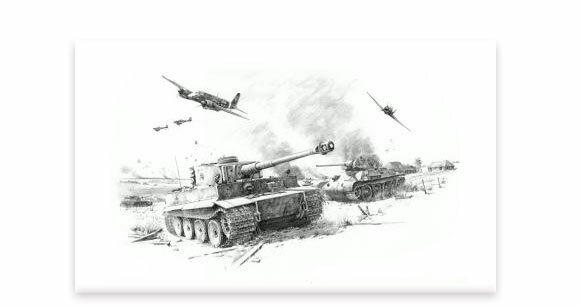 In July 1943, 300 miles south of Moscow,the wide rolling grasslands of Kursk witness the greatest tank battle in history as 6,000 tanks meet in frenzied conflict. With close support from ground-attack aircraft of the Luftwaffe, German panzers advance through the wreckage of Russian armour. However, in what proved to be a turning point of the war in Russia, this battle was eventually won by the Soviets. Each print is signed by Nicolas Trudgian and 15 Knights Cross winners. 7 Day Fighters, 3 Stuka Pilots and 5 Panzer Commanders.